Welcome to the Fort Lupton Colorado homes and real estate portal: one stop for finding single family, multi family, condos, townhomes, lots, land, residential income, and acreage real estate for sale in Fort Lupton Colorado. You can find homes for sale by sale types like new construction, foreclosures, and short sales or you can search for homes for sale by geographic characteristics like subdivision, school, and maps. The properties for sale in Fort Lupton change daily. Check back often for all the latest information on homes for sale in Fort Lupton. Fort Lupton is a Front Range community located along the scenic South Platte River. The community derived its current name from Lieutenant Lancaster Lupton who, in 1836, built a trading fort in the area. The community was incorporated into the state in 1974. Read more about the real estate market in Fort Lupton. Market Analysis - offers local real estate trends, current listings, and recent home sales, plus the ability to search different zip codes. Community Information - provides insight of average household income, neighborhood points of interest, education levels, weather risks, and crime statistics. Local Schools - includes detailed information on school ratings, test scores by grade, student-teacher ratio, and parent reviews. Compare Areas - lets users compare two zip codes using current information on community summaries, market stability, schools, listing price vs. sold price, buyer vs. seller market, and even smoking bans. Insider Tips - offers a wealth of resources to help you better understand factors that impact the real estate market. Market Insider Monthly eNewsletter - highlights local market trends and offers insider tips on buying and selling a home. 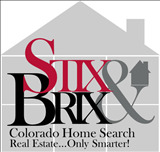 The content relating to real estate for sale in this Web site comes in part from the Internet Data eXchange ("IDX") program of METROLIST, INC., DBA RECOLORADO® Real estate listings held by brokers other than Stix-n-Brix Colorado Home Search are marked with the IDX Logo. This information is being provided for the consumers' personal, non-commercial use and may not be used for any other purpose. All information subject to change and should be independently verified.